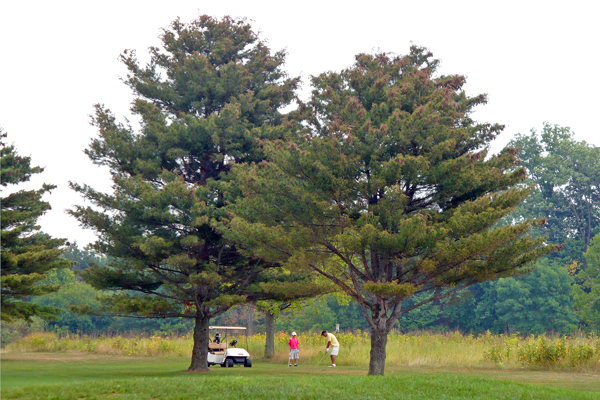 The 12th annual Bragging Rights Golf Tournament got underway today in Indianapolis, Indiana. This was the first year that Cameron played as an official competitor in the family golf outing. One of the stipulations of his partnership with Uncle Kevin, however, was that as the “girl” of their team he was to wear pink. While he wasn’t into the pink baseball hat that we purchased for him, he thought the golf shirt was really cool because he looked like young, hip professional Rickie Fowler. The pink shirt may have worked its magic, too. The first day, played as a scramble, was highly competitive, and Cameron and Kevin are in the hunt for the team title going into tomorrow’s individual phase. Plus, the starter at the golf course was so impressed with Cam’s wardrobe choice he gave him the special junior rate even though it’s not typically available on the weekend. Nothing like a little color (and a few dollars in your pocket) to brighten your day. Thank you, Patti. It was fun to watch him, especially in bright pink!